A New York police movie where one lawyer’s investigation uncovers scandal and corruption within the department. 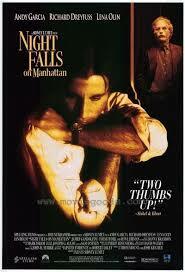 Night Falls On Manhattan is a pretty solid police corruption movie involving crimes, killings, trials, and scandal. It’s somewhat of a mystery that unwinds as it goes on, and it’s told in a way that always keeps you wanting to see more. That being said, it’s a little too much like some of the other movies that came out at the exact same time. 1996 and 1997. It is extremely similar to city hall, (also 1996), which featured al pacing as the mayor of New York who had ties to the mob or figures associated with the mob. In that movie, the central event that started it all was a shootout and accidental death of a child. After that, little by little began to get uncovered by straight man John Cusack. 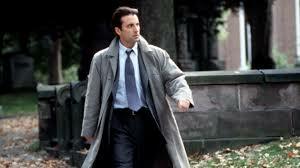 In Night Falls on Manhattan, Andy Garcia plays the straight man and again, there is an early big event involving murders that puts the gears of the story into motion. That event is the police capture of notorious Harlem drug dealer Jordan Washington. The police move in to capture him at his apartment and Washington ends up shooting and killing a number of them. He escapes the scene only to turn himself in and face a trial. The prosecutor is Sean Casey (played by Andy Garcia), fresh off the pages, thrown in there because his father (Ian Holm) is one of the officers who was shot and is now recovering at a nearby hospital. Casey is given the job because it will make for an incredible story. The lawyer who is not only fighting for the cause, but fighting for his father. And so the case begins. Jordan Washington is put on trial and he gets top lawyer Richard Dreyfuss (in what is possibly the last great role of his career), to represent him. Dreyfuss does an amazing job of uncovering a possible scandal whereby three different precincts sent police officers to the Washington arrest because he was paying off men from all three locations. Apparently there was a deal gone sour between Washington and the police officers and they weren’t there to take him in, but to take him out. To execute him before he talked. That’s what Dreyfuss was claiming anyway. The trial was a pivotal part of the movie, but the real scandal and mystery began after it was over. Washington was just a pawn to get the ball rolling. Casey is soon made head District attorney of New York City and internal affairs comes to see him about the corruption. They’re making a case against the New York City police officers that are allegedly involved and they want his help. And so Casey gives it to them. He goes to meet Richard Dreyfuss and hear him out too, about what he was after with the Washington case. Dreyfuss asks Casey to look into the police corruption charges and Casey agrees. Unfortunately, the movie kind of slows down after that. The two big set pieces of the movie are the apartment building police arrest (or attempted arrest) and then the trial. After that, the major scenes of the movie are gone. Now it’s just time to do a lot of talking and uncovering. And it seems to mostly be between Casey and his father and his father’s partner (James Gandolfini). Earlier on I compared this movie to city hall, and that movie really is the closest one to this, complete with a character shooting himself in a car and everything. But that movie is also better. That’s because in this movie, we kind of know what the truth is. We don’t want to hear it or to have to admit it, but we know it’s there all along. And so the movie is just about getting to hear it and seeing how it gets revealed. Was Casey’s father involved in the corruption or not? Either way, it’s more or less a simple yes or no and not much of a mystery on that front. City hall on the other hand, kept uncovering more characters that were involved in the corruption, and they were all characters that we didn’t really suspect. That added a lot to the mystery. But city hall isn’t the only movie from that time that was similar to this. Another one is primal fear (also 1996) about a murder trial and a cover-up and corruption between the district attorney and the archbishop of a local church. All three of these movies involve bodies being fished out of the river and a major crime at the beginning with ramifications that continue to unspool throughout the movie. All three involve corruption in either the police precincts or the district attorney’s office. And all three are dark mysteries. As if those three weren’t enough, there’s also Copland, from 1997, which is again about police corruption and scandal and how it gets uncovered. With all four of these movies from the same small pocket of time (1996-1997), at a certain point it just feels like too much of the same thing. And that hurts the movie night falls on Manhattan a lot. If it came out in theaters today, it would have been regarded as a better film, but back then, it was surrounded by a sea of similar ideas. And Night Falls On Manhattan is the weakest of the four films, just because it doesn’t end up going anywhere spectacular or leading to any major revelation (compare that to primal fear’s twist ending). But with that in mind, Night Falls On Manhattan is the work of the director who is better at police corruption movies than anybody. Sidney Lumet. He’s the mastermind behind some of the greatest movies of all time, and this is the genre that he does best. He’s the guy who made Serpico in the seventies and prince of the city in the eighties. From twelve angry men to network to dog day afternoon, Lumet is one of the greatest directors there ever was. His 2007 movie Before The Devil Knows You’re Dead showed that he was still in top form, even in his old age. And there is great showcasing going on in Night Falls On Manhattan too. There’s no doubt, it is the work of an enormously talented filmmaker. The police arrest scene and then trial scene are both fantastic. But the movie kind of loses its way and gets a little tiresome after that. It’s a good movie, but it needed a stronger push in it’s second half.